It is not easy to become a Paralympic athlete, but even more challenging than reaching the pinnacle of Paralympic performance is staying motivated, dedicated and on top. Homewood, Alabama resident Jennifer Schuble is well versed in this challenge. Schuble, an engineer in the production control department at Mercedes-Benz, balances a 40-hour work week, two-hour road training sessions each evening, biweekly weight lifting sessions at Lakeshore, and weekend velodrome workouts in Atlanta. She also squeaks in a few minutes each day to eat, sleep and play with her English bulldogs. 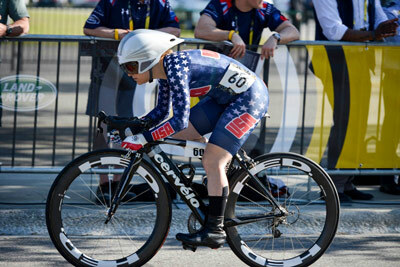 Through her persistent work and dedication, Schuble has become one of the top U.S. Paralympic cyclists and is embarking on her third Paralympic Games. Sport has been a constant in Schuble’s life. Growing up in Houston, Texas she began sports thanks to her older siblings. “I just followed my siblings to sports, and I turned out to be good,” said Schuble. Swimming, volleyball, softball, basketball, track, soccer – every sport that was available, Schuble tried and excelled. By high school she was approached by college coaches in track and soccer. Struggling to choose a college, she looked to her other passion for guidance. An Air Force Academy baseball cap was a constant component of her daily wardrobe, and a model rocket and jet collection was the decoration of choice for her bedroom. She chose to attend the United States Military Academy at West Point where she could continue track, soccer and train to be a pilot. One day during a hand-to-hand combat class, Schuble sustained a traumatic brain injury. She was transferred to Walter Reed National Military Medical Center where she began to learn how to live with her disability and reevaluate her plan. “At that point I was fighting to stay fit for duty,” said Schuble. In 1999, after much contemplation, Schuble decided to make the move to The University of Alabama and study production operations research. She graduated with her bachelor and graduate degrees and shifted her focus from planes to cars. The year after graduation Schuble was diagnosed with multiple sclerosis, which affects her balance, motor functions and causes spasticity and numbness. Schuble found that physical activity greatly reduced her MS symptoms, so she began competing in triathlons. After discovering Lakeshore Foundation and Paralympic sport, she focused on cycling and won gold at her debut event, the 2007 UCI Paracycling World Championships in Bordeaux, France. Since then, Schuble has become a five-time Paralympic medalist, including gold in the 500m time trial at the 2008 Beijing Games, a two-time world recorder holder, five-time world champion, and 12-time world medalist. Equally impressive as her abundance of accolades is her longevity in the sport. While many Paralympic athletes contemplate retirement after two Games, Schuble continues to peddle forward. Compete is exactly what she did in Rio. In fact, Schuble competed in five events, the maximum number of races available, and was the only American female to do so. She hopped between the Rio Olympic Velodrome and Pontal road course, finishing seventh in the 500m time trial, sixth in the 3k pursuit, fifth in the road time trial and eighth in the road race. As the only American female to compete in the mixed team sprint, a track event that includes teams of athletes from multiple classifications, the team finished just off of the podium in fourth place. Since Rio 2016, Schuble continues to represent the U.S. Paralympics Cycling Team in competition. March 22 through 25 she will head back to Rio de Janeiro for the 2018 UCI Para-cycling Track World Championships. Her decision to work toward Tokyo 2020 has not been made, but for now she will continue to work, train, eat, sleep and repeat. During an Olympic and Paralympic year its easy to focus on Lakeshore’s status as a U.S. Olympic and Paralympic Training Site. But everyday at Lakeshore, behind the rings and Agitos, elite national team training sessions and international competitions, you will find community programs that inspire new generations to be physically active and develop top-notch talent. Josh Roberts is a perfect example of the power of these programs. Roberts can usually be found in Lakeshore’s Fieldhouse, sprinting around the track or pounding on stationary rollers designed to accommodate his aerodynamic racing chair. His powerful pushes accompanied by syncopated breaths create a rhythm that can be heard beyond his small corner of the gym. His repetitive workouts are nothing new, but they represent the long road he traveled to become a three-time Paralympian. Fourteen years ago when Roberts first came to Lakeshore, he had no thought of the Paralympic Games. A Morris, Alabama native, Roberts acquired a spinal cord injury at the age of 20. “It was a pretty terrible time to get injured,” he said. Roberts grew up as an athlete, competing on the Mortimer-Jordan High School football and track and field teams, but at 20 years old he wasn’t sure how to tackle his new life with a disability. While at UAB Spain Rehabilitation Center, Roberts received a visit from long-time Lakeshore member and three-time Paralympic medalist in wheelchair rugby Bryan Kirkland. Kirkland invited Roberts, who was four months post injury, to watch a Lakeshore Demolition wheelchair rugby practice. After spectating a couple of practices, Roberts wasn’t ready to reengage into the community, and he certainly wasn’t ready for Paralympic sports. Two years after Roberts’ first visit, a job at Lakeshore’s front desk brought him back through the doors. From the lobby he made his way into the Fieldhouse where he saw Kirkland and former Director of Recreation Kevin Orr pushing on the track. He decided to give it a try. Nevertheless, his repetitive workouts began, his stamina increased and he began to adapt and accept his new way of life. In 2008, after three years of training and involvement in Lakeshore programs, not only was Josh competitive, he made his first U.S. Paralympic Track & Field Team and competed in the Paralympic Games in Beijing, China. That first experience on a world stage helped prepare him for more great things ahead. In 2010 he won a silver and bronze medal at the U.S. Paralympics Track & Field National Championships. After competing in the 2011 International Paralympic Committee (IPC) Athletics World Championships, Josh was named to his second U.S. Paralympic Team and competed in the London 2012 Games where he placed fourth in the 400m, sixth in the 100m, and eighth in the 200m and 800m. Josh entered his 2016 season as a veteran of the U.S. Paralympics Track & Field Team. 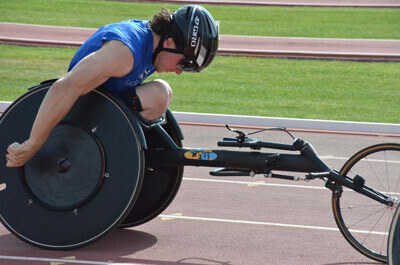 Since 2008, his T52 classification (for individuals with impairment in four limbs) had grown to feature new American talent and multiple podium threats. In addition, the elimination of the 200 and 800m events in his classification caused Roberts to shift focus to the 100m and 1500m events in preparation for the Rio 2016 Paralympic Games. His third Paralympic Games was about focusing on the clock, not just his competitors. His results did not include a podium finish, but he did record season-best times. As the Tokyo 2020 Games rapidly approach, Josh must make the decision to continue elite training. He’s not sweating the decision though. Because Josh’s Paralympic journey isn’t just about achieving athletic greatness, it’s about using sport as a vehicle to acceptance and self-mastery.